Combining cosmetic treatments such as Botox, Juvederm, and Voluma can provide fantastic results for facial rejuvenation. Botox is a purified protein that treats certain wrinkles on the face which are caused by muscle movement. The most common areas treated with Botox are in the upper face. These include the horizontal lines seen when we raise our eyebrows, the vertical lines between the brows seen when we frown, and the crow's feet around they eyes seen when we smile or squint. Results from Botox are seen as soon as three days after the treatment and most people enjoy their results for three to four months. Juvederm and Voluma are fillers made of hyaluronic acid, a naturally occuring compound found in the skin, and provide volume to areas of volume loss. Juvederm is most commonly used in the lower face to treat the smile lines from the sides of the nose to the corners of the mouth and the marionette lines from the corners of the mouth to the jaw line. 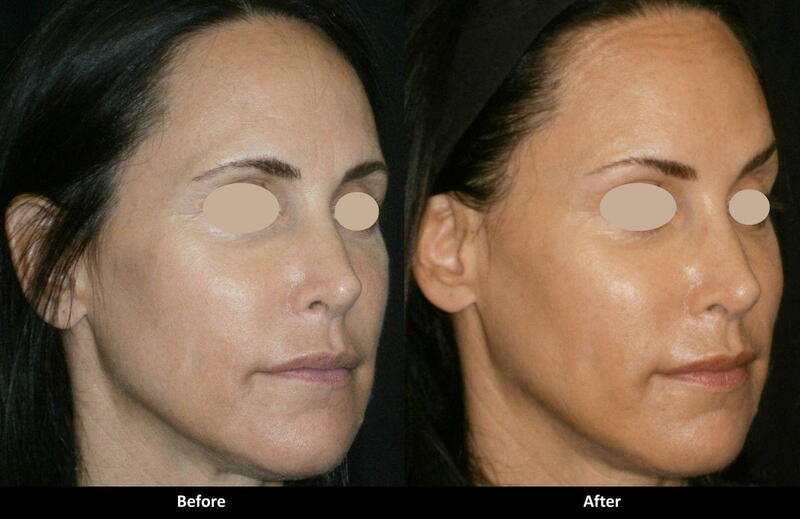 The combination of volume loss in the cheeks, loss of collagen in the face, and gravity lead to sagging and the formation of these lines and the jowls. Juvederm fills these lines to smoothen them out. Voluma is similar to Juvederm but designed differently so it can be used in the mid-face to provide volume to the upper cheeks which descends over time. Results with Juvederm and Voluma are seen right away. People enjoy the results of Juvederm for six to fifteen months and Voluma for approximately two years. The great thing about Juvederm and Voluma is that unlike Radiesse, a calcium product, they can be dissolved if there are any side effects, making it a safer treatment. The patient seen in this picture had Botox to treat the frown lines and crows feet, Voluma to provide volume to the upper cheeks, and Juvederm to smoother out the smile lines. What people love most about these treatments are that the results are noticable but subtle, so instead of looking like she had something done she looks refreshed and rested. Contact Us for a free consultation with Dr. Alex.